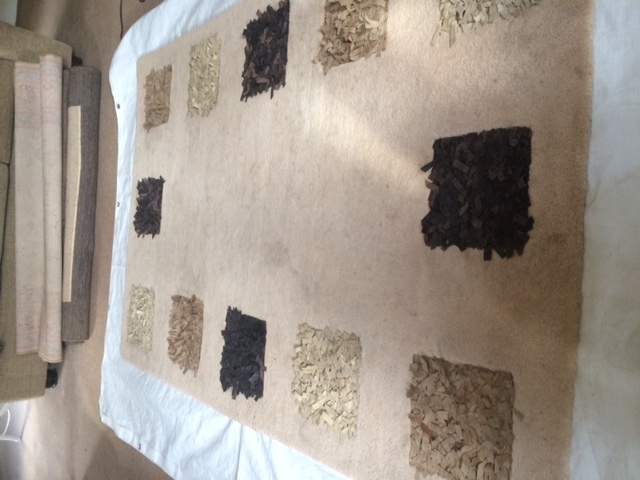 Had the opportunity to clean a couple of unusual rugs today. Normally rugs , or carpets if they are of a larger full room size, are made of wool. Some are made of silk and most everyday ones are made of manmade fibres. 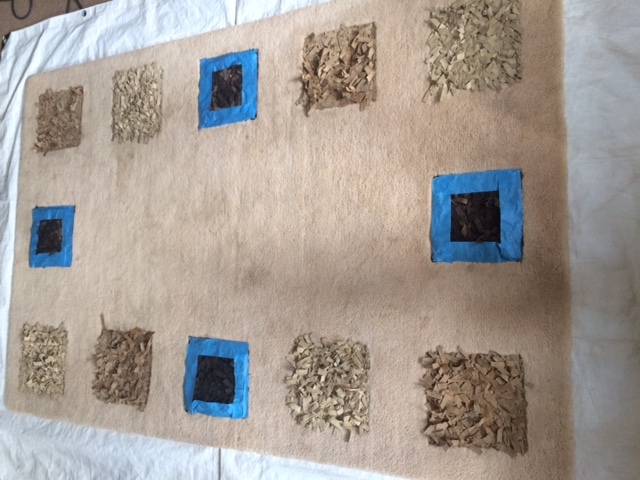 These rugs were wool with areas of leather stitched in therefore meaning there were cleaning issues to consider with both the wool and the leather. 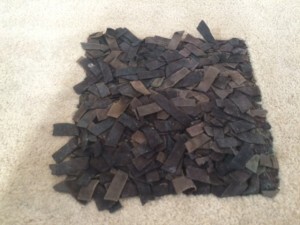 Here you can see the rug with each square made up of different coloured leather strips. The dark brown squares were of particular concern as any colour transfer to the wool would be clearly visible and difficult to remove so we needed to think about how to clean it. 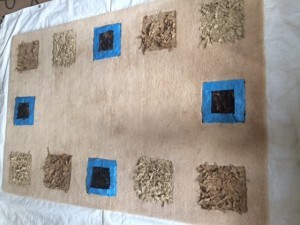 As with any wool rug cleaning, or indeed any wool carpet cleaning first of all tests were done to check that the wool was colourfast and didn’t react with the proposed cleaning solutions. Having established all was good the rug was given a thorough vacuuming. As with all rugs the vacuuming is probably the most important stage. Its amazing how much soil can be hidden deep within the pile. 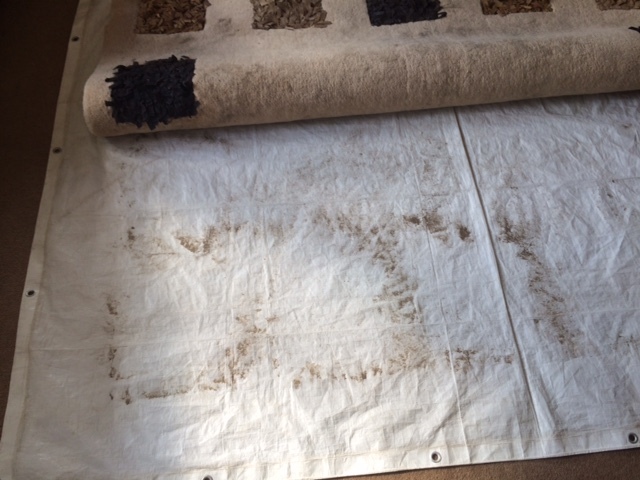 This rug didn’t on the face of it appear that dirty but following a lengthy vacuuming of the back of the rug using a professional vacuum with a heavy duty beating mechanism the soil is knocked out before the front of the rug is then given a thorough vacuum to remove what soiling remains. 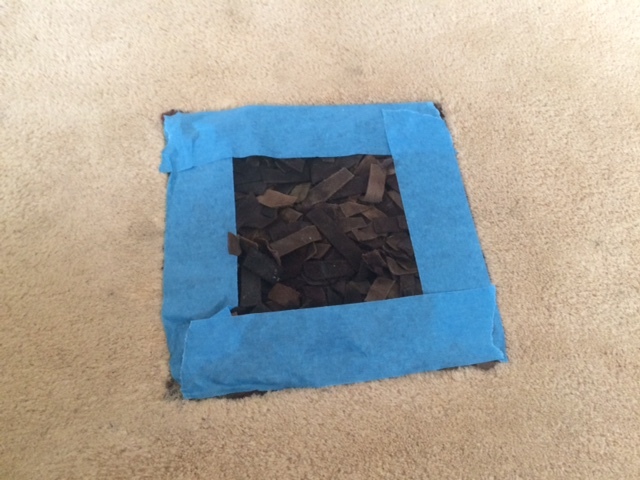 This is the dirt that has come out of just part of the rug following the back vaccing of the rug. 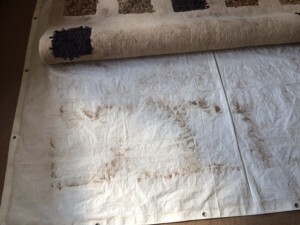 Don’t forget this is a rug that didn’t look that dirty but an amazing amount of dry soil can be hidden within one. It clearly illustrates why its important to get this soil out before any attempt to clean the rug takes place. In order to protect the leather and the wool we then masked off the dark areas to prevent colour run and then cleaned using a special cleaning solution that is great with organic soiling and which is delicate enough to not cause any damage to the leather. If you have an unusual rug or indeed any other type of rug that you want cleaning then call us and we will be happy to advise you on the best methods for your rug.